This island themed penthouse is the largest floorplan Kolea has to offer at 2576sf. Kolea is a magical beach side resort featuring direct beach access to popular Anaeho'omalu Bay. It is also within easy walking distance to the Waikoloa Kings Shops and the Queens Marketplace for convenient dining, shopping and enjoying local entertainment. There are three bedrooms, all with their own private bathrooms, a half bath, a grand main lanai with a built in barbecue grill and outdoor refrigerator, a smaller lanai off the master bedroom, a full size laundry room and a secure elevator with a key and intercom access system that services two villas. 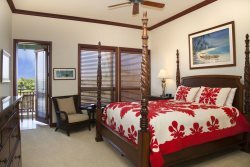 The master suite is furnished with a king bed, and covered with a hand quilted tropical bedspread. This suite has a television, private lanai, walk in closet and spacious bath complete with dual vanities, a walk in shower with dual shower heads and sprayers, and a deep soaking tub. The guest suite is also furnished with a king bed and hand quilted bedspread. This suite has a television, huge walk in closet, and a private bath with dual vanities set in travertine stone, a walk in shower and a deep soaking tub. The third bedroom has a lovely four post queen bed, television and private bath with walk in shower. The fully stocked kitchen enjoys natural lighting from the high windows in the cathedral ceiling. Four glass blown pendant lights descend to illuminate the large granite island. The built in Viking and Subzero appliances are finished in stainless steel and include a personal wine cooler with a glass door. The dining table seats six and bar stools at the island provide additional seating for casual dining. The great room features a large flat screen television. A couch and two arm chairs with ottomans provide comfortable seating for relaxing indoors. A work station includes a printer and desk top for guests. The lanai doors of the great room completely retract into the pocket wall to create an even larger living area. Enjoy ocean and garden views. A summer kitchen complete with a Viking barbecue grill, hood, sink and outdoor refrigerator allow for convenient grilling and outdoor dining. The lanai table has seating for four and two armchairs with ottomans are the perfect spot for enjoying your morning coffee and sunset cocktails. A powder room in the hall displays an elegant copper vessel on a travertine pedestal top. The laundry room is equipped with a full size washer, dryer and sink. This island home is air conditioned and there are ceiling fans in every room. Wireless internet and local phone service is included. An audio/video intercom allows you to see into the elevator for your security, and the elevator is also able to be activated with a key. Kolea guests enjoy the use of the Kolea Beach Club which has a pool, spa, exercise hale and keiki pond complete with a waterfall and sandy bottom. Kolea is the only resort in Waikoloa which has direct beach access to grand Anaeho’omalu Bay. A short walk to this sandy beach and you will find activities such as snorkeling, glass bottom boat tours, paddle boarding and whale watch cruises. The Waikoloa Beach Marriott is immediately south of Kolea and the Hilton Waikoloa Village is north of Kolea. Both hotels offer dining, spa treatments or luaus. The Hilton is also home to Dolphin Quest.